Such a good feeling. Speaking of good and healthy – I think my perception of healthy living is different from the perception of other people. When I say that I live a healthy life I think… I’m happy, active (in whatever sense makes me happy), surrounded by people I love, healthy and I eat food that gives me energy and a sense of satisfaction – food prepared at home, from ingredients that are available to me, delicious and fresh. So, for example, I don’t think of cakes as junk food, especially those that are home made and prepared from fresh fruit and a fist full of love. I enjoy them. My mom’s apple pie or cherry strudel are classics that I don’t wanna miss (I’m trying to persuade mom to guest post with her strudel). I’m now createing some of my own classics, cakes and recipes that I will gladly prepare for my family, small, big, whatever it is and will be. This cake may become one of my classics. I found the basic recipe in an old issue of the magazine BBC Good food and tailored it to my taste and preferences. 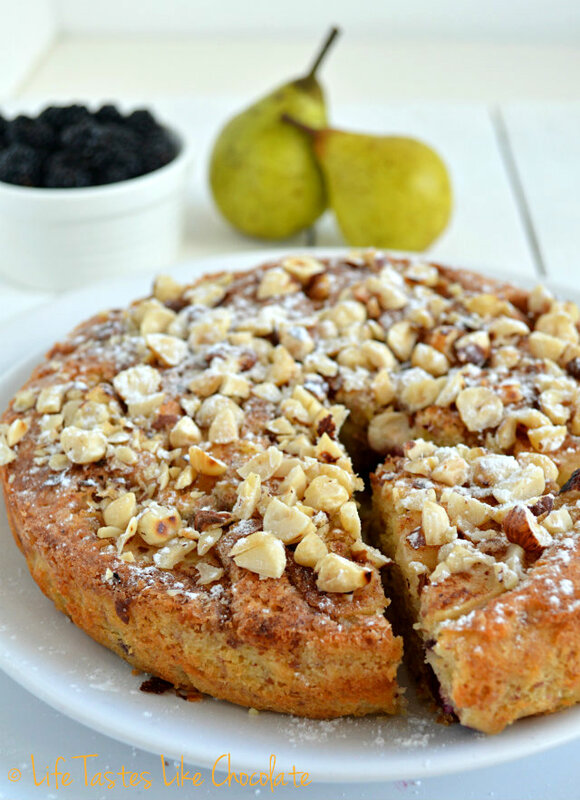 I added lemon, pears, leveled the amounts a bit – and got a beautiful, rustic cake liked by all those who tried it. And by my mom as well :) One very healthy cake – in my sense of the word! Preheat the oven to 160 ° C. Grease your mold and line it with parchment paper. I baked this in a plain bowl with metal handles because I wanted a small, round cake - and I don't have such a cake mold. Mix the butter and sugar until nice and fluffy, then add the lemon zest and beaten eggs, little by little. Then using a spatula gently fold in the flour and almonds. Peel the pears and cut into slices or cubes and wash the blackberries. Stir in half of the pear mixture. You can mix in the blackberries as well, but I didn't want them to dye the batter. Put half of the batter into the mold, align and sprinkle the blackberries. Then cover with the other half of the mixture, smooth out and arrange the remaining pears on top. Mix the sugar, cinnamon and butter slices and sprinkle on the cake. Bake for about 50 min, or until a toothpick stabbed in the middle comes out clean. While the cake is still warm, remove it from the pan and sprinkle with coarsely chopped toasted hazelnuts. Hazelnuts are tosted by baking them on a dry pan for a few minutes and then rubbing in a kitchen towel to remove flakes. When the cake has cooled, sprinkle it with ucung sugar and serve. Bon appetit! P.S. You can make this cake with other combinations of fruit - apples and raspberries, blueberries, even mangos or strawberries. I can't wait to try out another combination!